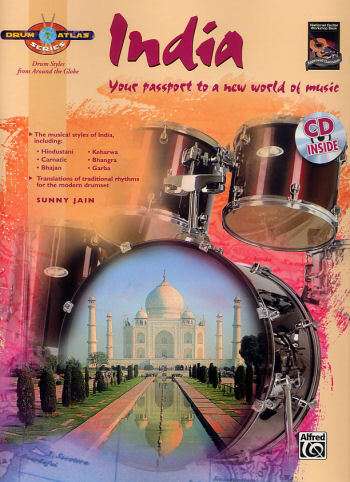 Tiger Bill Reviews the Drum Atlas Book and CD Series: Drum Styles from around the globe from Alfred Publishing. This six book/CD series, from Alfred Publishing and the National Guitar Workshop, serves to intoduce the beginning drummer to some of the most important drum styles from around the globe. The materials all follow the same basic easy to learn format - Each style is written out in standard music notation and demonstrated on the included CD with a full authentic-style band. Let's check them out. 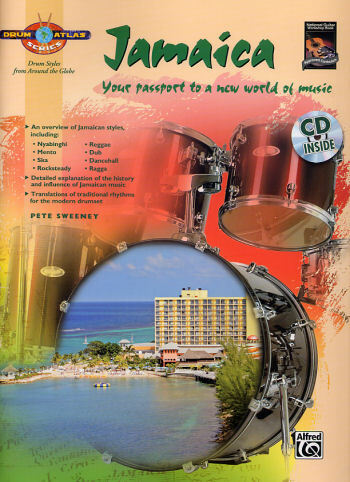 Introduction: includes practice consideration, a brief history of Jamaica, the Rastafarari movement, a brief description of each of the major Jamaican music styles covered, and a drumset notation key. Early Jamaican Styles: This chapter includes Nyabinghi Drumming, Calypso, Soca, and Mento. Ska: Includes Hi-hat rhythms, role of guitaris and bassist in Ska, cross-stick technique, the Three Waves of Ska, and Ska drum fills. Rocksteady: Cross-stick Ideas and Hi-Hat Variations. Reggae: Three-Drop, Hi-Hat Rhythms, Cross-stick with Three-Drop, Steppers Beat, Hi-Hat Rhythm with Steppers Beat, Reggae with Swing Feel, Swing Eighth Hi-Hat Rhythms, Eighth-Note Triplet Rhythms, Four-stroke Ruffs, Quarter-Note Triplets, Two-Measure Reggae Beats, Rockers Style Reggae Beats, Bob Marley, Sly Dunbar, Dub Reggae, Stewart Copeland Reggae Beats, and "Walking on the Moon." Reggae Drum Fills: Timbale Drums, Snare Drum Fills, Resolving Drum Fills, and Reggae Intro Fills. Additional Jamaican Styles: Dancehall, Ragga, Theme and Variation Beats, Conclusion, and Recommended Listening Guide. Introduction: Some suggestions for using the book. Getting Started: North Indian Percussion Insturments, South Indian Percussion Insturments, Popular Non-Percussion Indian Instruments, Tal, Vocalizing, Counting, Clapping, and Solkattu. Indian Beats Applied to the Drumset: The Setup, Tintal, Keharwa, Bhejan, Bhangra, and Garba. Indian Rhythmic Concepts: Linear Phrasing, Yati, Lay, and Tihai. Final Word and References for further study. Introduction: includes drumset notation and Setup. 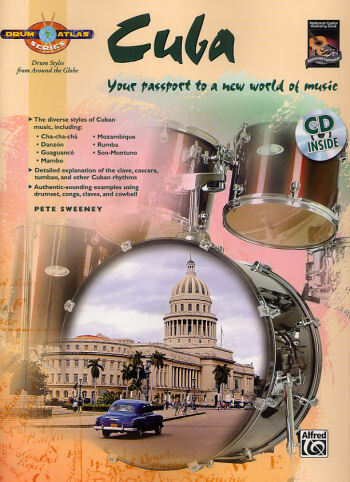 Understanding the Basic of Cuban Music: The Clave, Five Clave Rhythms, Tumbao, Tumbao for Congas, Conga Rhythms for Drumset, and Montuno. Cascara Rhythm: Timbales, Cowbell, Adding Bombo Note on Bass Drum, Adpating the Tumbao to the Bass Drum, Tumbao for the Left Hand, Coordination Studies, Left-Hand Melodies with Right-Hand Cascara, Cascara Pattern with Bass Tumbao, Cascara Pattern with Piano Montuno, Melodic Variations with Cascara, and Using the Stepped Hi-Hat. Traditional Son Clave Styles: Mambo, Son, Son-Montuno, Danzón, Cha-Cha-Chá, and Mozambique. Traditional Rumba Clave Styles: Cascara with Rumba Clave, Guaguancó, Conga, Bembe, and Pilón. Contemporary Cuban Styles: Songo and Timba. Appendix: Jam tracks, suggested listening guide, and conclusion. 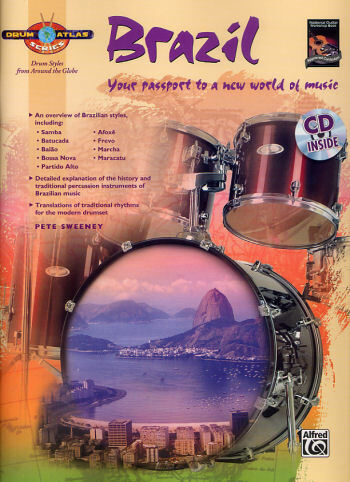 Introduction: includes history of Brazil, musical history, and the drumset in Brazilian music. Brazilian Percussion Instruments: Surdo Drum, Tamborim, Pandeiro, Repinique, Ago-Go Bells, Cuica, Ganza, and Samba Whistle. Basics of Brazilian drumming: Basic Samba Groove, Bass Drum Variations, Brazilian Notation, and Hand Patterns with Samba. The Samba: Batucada, Samba with Snare Drum, Batucada Accent Pattern, Two-Handed Samba Patterns, Adding Accents, Samba Hi-Hat Patterns, Cross-Stick Technique, for Samba, Ride Patterns for Samba, Using the Floor Tom, Floor Tom Samba, Samba with Brushes, Samba around the Full Set, Samba with Cowbell, and Samba with Half-time Feel. Baiáo: Baiáo Ride Patterns, Baiáo Hi-Hat Pattern, Bass Drum Variation, Traditional Snare Drum Rhythm for Baiáo, and Baiáo Rhythms with Mixed Stickings. Bossa Nova: Bossa Nova with Brushes. Additional Brazilian Styles: Partido Alto, Afoxê, Frevo, Marcha, and Marcatu. Latin Percussion Instruments: Claves, Congas, Bongos, Timbales, Maracas, Güiro, Güira, Tambora, Cowbells, and The Drumset. The Fundamentals of Salsa: Understanding the Clave Rhythm, Cascara, Tumbao, Tumbao for Congas, Cascara with Bass Tumbao, Piano Montuno, Bell Patterns, Two-Bell Patterns, Bongo Bell, and Salsa Song Form. Musical Styles: Mambo, Son, Rumba, Son-Montuno, Guaguancó, Cha-Cha-Chá, Bomba, Mozambique, Merengue, Afro-Cuban 6/8, Songo, Plena, and Latin Jazz. Drum Fills and Soloing in the Salsa Style: One-Measure Fills, Resolving Fills, Two-Measure Fills, Quarter-Note Triplet Ideas, Using the Left-Foot Cowbell, Soloing over a Vamp, Jam Track, and Listening Guide/Conclusion. Introduction: What is African music? Traditional Percussion Instruments of Africa: West African Drums including Djembe, Goumbe, Djun-Djun, and Donno. Traditional Drums and Tuned Percussion including Sabar, Gankogui, Gyil, and Mbira. North African Drums including Bendir, Riq, Darabuka, and Naqqarat. From Hand Percussion to the Drumset: Development of the Western Drumset, Drumsets of the 21st Century, Oral Tradition to Written Notation, Different Mallets, "Prepared" Drumset Techniques, and Other Ideas. West African Applications for Drumset: Includes variations of Sinte, Dogon, Senegal, Aconcon, Soli, Carabali, Fanti, and Gahu patterns. More Rhythms From West Africa: Variations of Kassagbe, Shiko, Kpanlogo, and Djole. North African Applications for Drumset: Includes Moroccan, Ayub, Nawarji, Baladi, Chiftitelli, Nsraf, Zaffah, Zaar, Bizeet, and Chakka patterns. 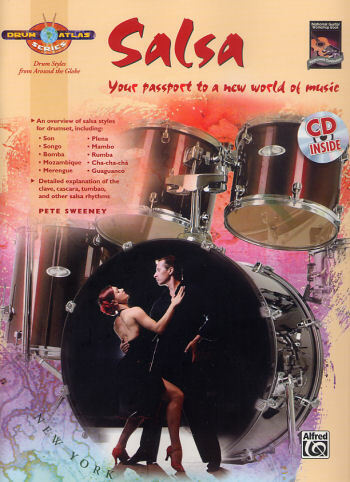 East and Central African Applications for Drumset: Includes Rwanda, Son clave, Conoglese Rumba, Congolese Clave, and Congo Rumba Rock. 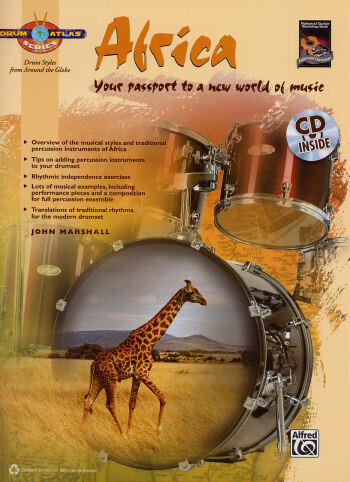 SouthEastern and South African Applications for Drumset: Includes Zimbabwe's Mbira Music, Chimuranga patterns, and various South African drumset patterns. Performance Pieces and Additional Information: Includes three performance peices that will help you assimilate some of the rhythms you've been studying up to this point and materials for further reading and listening. If you are new to these global drumming styles, this series of book/CD packages will give you all you need to get you started.